Ketamine FAQ - Here are a few Ketamine frequently asked questions. The first step in your journey should be to find a physician who is trained and qualified to administer ketamine infusions safely and effectively according to the American Psychiatric Association and the American Society of Anesthesiologists guidelines. “Ketamine Clinics” are now becoming more common in some communities and unfortunately can vary widely in terms of quality, experience and expertise. Some physicians providing ketamine infusion therapy, may be well meaning, but have little experience or formal training in ketamine infusion therapy. Oftentimes, they heard about the remarkable benefits of ketamine for depression and anxiety and read one or two papers that were published on the subject and then think that they are qualified to begin performing infusions. Because of this, results can vary widely and many patients do not achieve the full benefits of ketamine therapy. Ketamine therapy is a very precise and meticulous therapy that requires experience and expertise. Unfortunately, there may be some physicians that just see ketamine infusion therapy as a simple office procedure that requires little or no direct involvement on their part and can produce some additional revenue for their practice. They are often busy seeing other patients while a nurse starts your infusion in an isolated exam room and occasionally will "check in on you". In our view, and the view of the American Psychiatric Association, this is not a safe practice. Let’s not forget that ketamine is a potent medication and it is an anesthetic drug, you should be very cautious if the doctor is only with you for 5 minutes before the infusion or a fully trained member of the healthcare team is not with you at all times during you infusion. You best safeguard is to find a physician adequately trained to perform these infusions safely and effectively. 1. Be very skeptical of any “ketamine clinic” that uses a “call in” answering service to give you information. Often you will be speaking to someone in a remote location with no personal knowledge of ketamine therapy who can only answer simple questions from a script. They may only be concerned with offering you an appointment in the clinic as soon as possible. It is important that you speak to someone with direct knowledge and experience in ketamine infusion therapy who can answer all of your questions from the start. 2. Ask where they were trained in the use of ketamine. Your physician should be thoroughly trained and experienced in the administration of ketamine for mood disorders and related conditions. Ask if they are certified in ketamine therapy. The Ketamine Research Institute trains physicians from around the US and Internationally to administer ketamine safely, under strict protocols and guidance set forth by the American Psychiatric Association and the American Society of Anesthesiologist recommendations. 3. Be very careful if they do not assure you that a fully qualified member of the health care team will be you at all times during the infusion session. It is not advisable to just have someone from the office “check in on you” every once in a while. You are being given a very potent medication and should be observed and monitored on a continual basis during your treatment. 4. Be suspicious of any provider that prescribes supplemental ketamine in a nasal spray or oral formulation. There are many unintended consequences to the use of such agents, including the possibly of having adverse side effects, becoming dependent or developing tolerance to the medication quickly and thereby losing its effect rapidly. 5. Be concerned if they do not require your medical records. All legitimate physicians providing ketamine to a patient will request medical records and labs from your doctor. If they do not ask for these documents or say that they are unnecessary that may be a warning sign that they may not be reputable and are operating a “mill” type of operation. How is the RESTORE different from other treatments? No single medication, combination of medications or other therapy can compare to the rapid and effective response seen with the Restore Ultra-Rapid Infusion - the "Gold Standard" in ketamine-based therapy. So, it is easy to see why many of the top scientists, physicians and researchers in the country are calling this new and innovative form of therapy "the most remarkable breakthrough in the last 50 years." 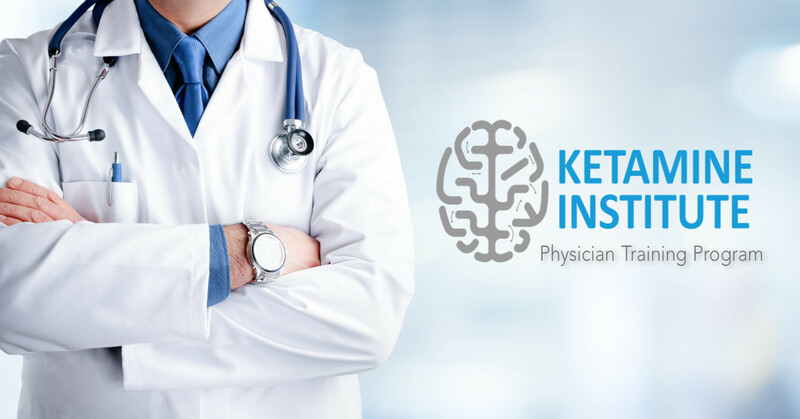 Today most, if not all, of the physicians utilizing ketamine to treat depression, anxiety, migraine and chronic pain are using the same “standard” ketamine infusion protocol was developed in 1994 and published in a research study at Yale in 2000. The results of the standard infusion today are generally the same as they were 18 years ago; treatments takes two weeks to complete and on average of 50-70% of patients obtained a 50% or greater relief of their symptoms but the beneficial effects only last for a few weeks, commonly 21-28 days. While the results of the "standard" ketamine infusion are indeed “remarkable” when compared to current medical treatments available for many of these difficult conditions, unfortunately the treatment is time consuming and the benefits don't last long enough. We knew they could be better!...with RESTORE. We have spent almost 20 years researching and developing ways to enhanced the effects of ketamine and to make it last much longer. By utilizing Precision Medicine and Targeted Therapy combined with cutting edge research and innovations in the fields of Anesthesiology, neuropharmacology and neurocognition, we have significantly improved ketamine’s ability to treat depression, anxiety, PTSD and chronic pain conditions like migraine headaches and Fibromyalgia. 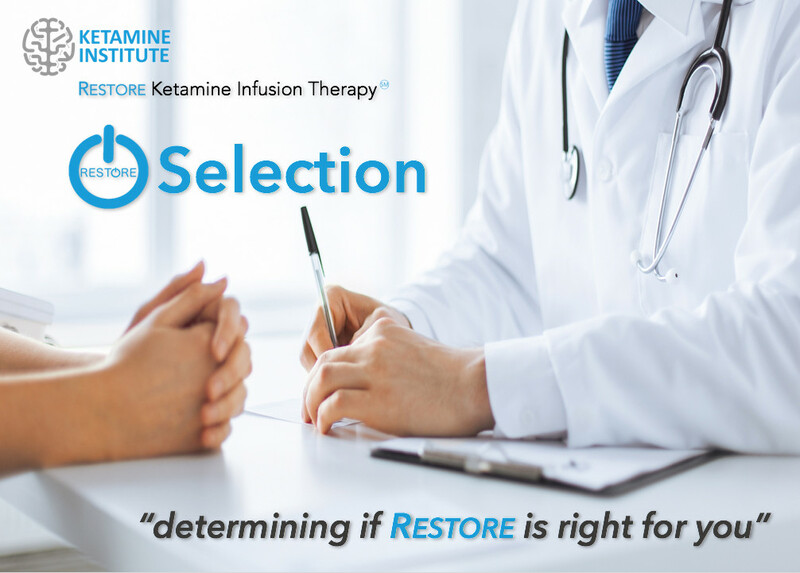 We are the only center in the United States that offers both the RESTORE Ultra-Rapid Infusion and the Yale-National Institute of Mental Health "Standard ketamine infusion" protocols. Each has its advantages and it is important to recognize the difference between them to determine which might be best for your individual needs. 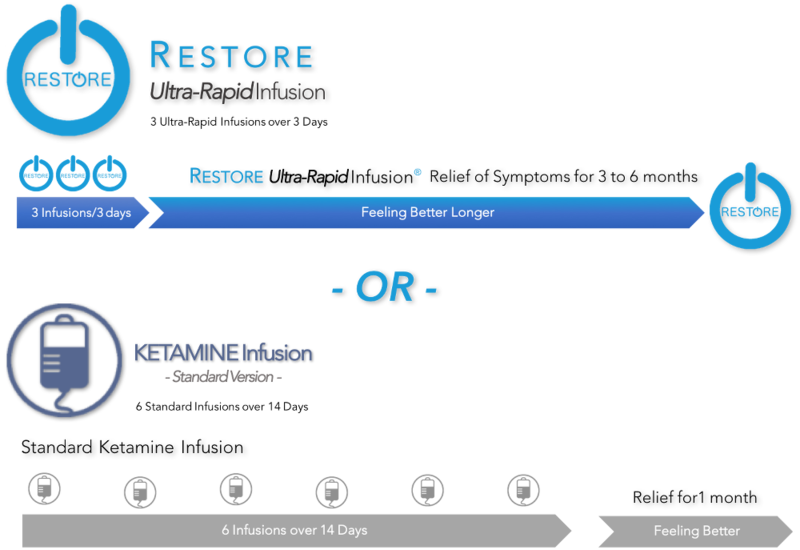 The RESTORE Ultra-Rapid Infusion is different from the "standard infusion" and is the most advanced formulation of ketamine therapy available. It is faster and more effective than any other ketamine infusion and when combined with Precision Medicine and Targeted Therapy can last 3-6 times longer than the standard infusion. The beneficial results can begin in just as minutes to hours after the very first infusion! What conditions can the RESTORE Ultra-Rapid Infusion treat? We are just beginning to learn and appreciate the full range of all of the conditions that ketamine can help. It has been known for years to treat all forms of chronic neuropathic pain and depression. But even more than that, we now are seeing that it has broader applications and is successful in treating treating pelvic pain and vulvodynia/pudendal neuralgia. There is also research to support the beneficial effects of Restore in the treatment of Alzheimer's Disease, Parkinson's Disease and other neurodegenerative disorders. It should really come as no surprise because we also have recently discovered that all of these conditions share many of the same neural pathways that ketamine targets. Ketamine has been described as the most important breakthrough in the last fifty years for the treatment of depression, anxiety and chronic pain. It is an FDA approved anesthetic drug that has been used safely and effectively in hospitals worldwide since the 1960’s. In the last few years numerous articles in medical journals have shown efficacy in using ketamine in sub-anesthetic doses to treat depression and some chronic pain syndromes. Major drug companies are now taking note of it's remarkable effects and rushing into development of medications based upon its effects. For the past 18 years researchers have known that tiny doses of ketamine can rapidly relieve depression symptoms when delivered via slow intravenous infusion. Yale University School of Medicine published the first scholarly paper describing this discovery in 2000. Since then, dozens more studies have been conducted by Yale and other major institutions, including the National Institutes of Health, Harvard, Johns Hopkins, Mount Sinai Medical School, Oxford University, and more. The original findings have been reconfirmed many times. Although medical professionals are technically going “off-label” when using ketamine to treat patients with chronic pain and depression, as many of 40% of all prescriptions written for patients in the US are “off-label” use including such things as the use of antidepressants for pain, anticonvulsant medication to treat Fibromyalgia and even blood pressure drugs to regrow hair. Fortunately for ketamine there are many clinical trials supporting the evidence that this drug successfully treats those who suffer from chronic pain and depression when nothing else can. Doctors and scientists report that their deeply depressed patients who are treated with ketamine respond within just a few hours! No other drug used for depression has the ability to bring relief in anywhere near this short amount of time. And with infusions administered in sequential fashion fundamental brain healing can occur. Is RESTORE Ultra-Rapid Infusion Therapy right for me? Not everyone needs the RESTORE Ultra-Rapid Infusion, many do well enough with the standard ketamine infusion. So, it is important to choose the treatment which best suits your needs. And soon, there will be yet another option, the RESTORE Essential Infusion which combines some of the advantages of both infusions into a more convenient option. But, if you suffer from more severe or long term depression, anxiety, PTSD or migraines and have not had relief with prescription medication or other traditional treatment modalities, then the RESTORE Ultra-Rapid Infusion therapy may be an option for you. Also, if you have undergone a standard ketamine infusion in the past but the results were not what you had hoped for; or your improvement only lasted for a few weeks, then Restore can be very helpful. The procedure is easy to administer and essentially pain free. In just 3 days and with 3 infusions, you can obtain more rapid, effective and long term relief than is possible the standard ketamine infusion. 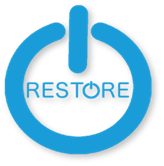 We are happy to provide you with an initial consultation to see if RESTORE is right for you. Who is not a good candidate for ketamine therapy? Also, the use of certain medications may interfere with obtaining the best possible result from the infusion. For example, patients taking large doses of benzodiazepines may have a reduced response to ketamine. This does not mean you can’t receive ketamine treatment while taking benzodiazepines. It is perfectly safe; we just want to ensure the best possible chances for your success. We may ask you to skip a dose 24-48 hours before the start of your infusion and wait until 6 hours after before resuming your benzodiazepine. Some common brand names for benzodiazepines are Xanax (Alprazolam), Ativan (Lorazepam), Valium (Diazepam), and Klonopin (Clonazepam). There are currently three other medications, which are known to significantly interfere or block the response to ketamine, and these are lamotrigine (Lamictal), risperidone (Risperdal) and olanzapine (Zyprexa). They are “relative contraindications” to therapy and may need to be reduced or discontinued prior to treatment. Prior to arranging for treatment, we would like to speak with you and discuss your current medical issues and medications. You should not adjust your dose or frequency of use of any prescribed medication without first consulting with your prescribing physician. How many RESTORE Ultra-Rapid Infusions will I need? We have spent many years determining the optimal formulation and number of infusions to increase the durability of ketamine based therapy. RESTORE is a very advanced formulation of the "ketamine infusion" and because of that our patients only need 3 infusions given over successive days to obtain more rapid, effective and prolonged beneficial effects. RESTORE Ultra-Rapid Infusion Therapy is a significantly more advanced, innovative protocol compared to the one developed in 1994 at Yale. We have incorporated both Precision Medicine and Targeted Therapy with the latest research advancements in the fields of Neuropharmacology, Anesthesiology and Cognitive Neuroscience to significantly increase the effectiveness and duration beyond anything that is currently available. RESTORE Ultra-Rapid is specifically designed to help those individuals who suffer from complex issues such as severe chronic pain and medically intractable “treatment-resistant” depression or PTSD. If you have had "standard" ketamine therapy in the past and found that it was not effective or did not last very long, RESTORE can help. Or, if you have had "standard" ketamine therapy and would just like to continue it or if you would prefer to begin with the standard infusion, we can certainly provide that as well. The results of a RESTORE Ultra-Rapid Infusion can be seen very quickly, in as little as one treatment, but are often not seen until after the full course of treatment is complete. Many of our patients who respond see significant improvement the day after their 2nd infusion. That being said, it is now known that a small percentage of the population (approximately 15%-17% or about 1 in 6 people) have an “unusual” configuration of their NMDA ketamine receptor, a BDNF variant or low acetyl-L-carnitine levels and are less responsive to ketamine therapy in any form. At the present time there is no commercially available way to determine or test for those people who have the “unusual” receptor, but we are hopeful that the lab test will be available in the next 1-2 years. Generally speaking you will be with us at the RESTORE Infusion Center for approximately 2 to 3 hours, sometimes a little longer. The length of the infusion may depend on your diagnosis and protocol; most of the infusions will be 30 minutes to one hour. After the infusion you will stay for another 30 minutes to recover. What should I expect during my RESTORE Ultra-Rapid Infusion treatments? That’s a great question. The RESTORE Infusion experience is unique and very personal for each patient…for a more detailed explanation please go to the RESTORE Infusion Experience page. Generally, patients commonly feel very relaxed following an infusion. On rare occasion, some patients experience nausea after an infusion. If so, we have medication that will relieve this. If you are prone to nausea, we can administer an anti-nausea medication before the infusion to help prevent it. Any mild side effects usually dissipate within a few hours and are completely gone by the following day. There are zero long-term or permanent side effects following medically supervised IV ketamine infusion therapy. Will I require RESTORE therapy for the rest of my life? No, not with Restore...just 3 infusions can provide long term relief. Some patients achieve long-term relief after one series of infusions. Others will find that infusions enhance the impact of antidepressants or provide initial relief that is then sustained by oral medicines, other therapies, and lifestyle choices. After the initial series of three infusions restores the brain to a healthy balance, it is generally easier to maintain that balance than it was to attain it in the first place. Follow-up or “maintenance” infusions are provided at the 3 month mark and one more 6 months following that. After this, many of our patients enjoy long-term benefits and only return on an "as-needed" basis. That is one reason why RESTORE is consider the "Gold Standard" in ketamine-based therapy. RESTORE Ultra-Rapid Infusions at a convenient time for me? Yes, you can...we offer weekend appointments. Most of our out of town patients find it more convenient to schedule treatments over a long weekend to avoid prolonged time away from work or other responsibilities. We generally schedule new patients who are coming from out of town, or international patients, to initially meet with us on a Friday. At that time, I review their medical history, performed my examination and evaluation and begin treatment sessions that day. The initial infusion treatment sequence consists of three separate infusions, which are then given on Friday-Saturday-Sunday of the week that you are with us. So you can get back to work and family on Monday morning as usual. Not one of our patients has displayed or reported any symptoms of addiction. In fact we have utilized the RESTORE Infusion to treat addiction or opioid dependence as it has been found to be remarkably effective in preventing withdrawal symptoms and medication craving. There is even current research, which indicates that ketamine may be used to combat alcohol, heroin and cocaine addiction and that is an avenue that we may be actively pursuing in the future. Do I need a referral for RESTORE therapy? You do not need a formal referral from you treating physician. However, we will need to obtain your medical history and recent treatment notes from your treating physician. In addition, we will also need to obtain a brief chronic pain and/or depression assessment. All of the information is then collected and I review it personally to determine if you are an appropriate candidate for the infusion. Once that is completed, arrangements can be made to schedule your visit with us. Do I need to bring someone with me to my RESTORE treatments? Although you do not need to have someone bring you or remain with you during the infusion, a competent adult must bring you home. We advise you not to drive a car, operate heavy/dangerous machinery, sign any contracts, or partake in other potentially risky activities until the following morning. If you do not have someone who can come with you, we can arrange, with our Hyatt Place partners, for you to be safely taken to and from our Center for your infusion sessions. You cannot eat solid food for 6 hours prior to your scheduled appointment. You may have clear liquids such as water, clear broth, apple juice or clear tea/coffee (no milk or leaves) up to 2 hours before your appointment. Unfortunately, healthcare insurance companies uniformly regard this remarkable form of therapy as “investigational” as opposed to what it truly represents “innovative” and use that as the reason not to not cover it at the present time. We hope that will change someday as they realize the tremendous benefit and cost savings of this remarkable therapy. I understand that cost is always a factor in these decisions, so it’s important to have all the information you can obtain. We offer two versions of the therapy; the first is what is commonly known as the “standard infusion”. This is the infusion commonly used by other ketamine centers and was originally developed at Yale and the National Institute of Health in 2000-2006 and the second is the more advanced version, RESTORE Ultra-Rapid Infusion. The standard ketamine Infusion requires 6 infusions given every other day over a two-week period and costs $2950.00 for the complete treatment including the initial evaluation. Each maintenance infusion is $450.00 per infusion. Although it appears to be less expensive the RESTORE, the initial time commitment can be a barrier and the fact that you will require ongoing treatment each month can become very expensive for many people. Also, please be aware that the standard infusion is not significantly effective in many cases for fibromyalgia or migraines and cannot treat chronic neuropathic pain conditions. RESTORE Ultra-Rapid Infusion Therapy is usually performed over 3 consecutive days and costs $4950.00 for the complete treatment. After the initial series of 3 infusions, patients usually only require 2-3 maintenance infusions at 3 and 6 month intervals and then may not need continued regular treatment. The cost for each maintenance infusions is $825.00. 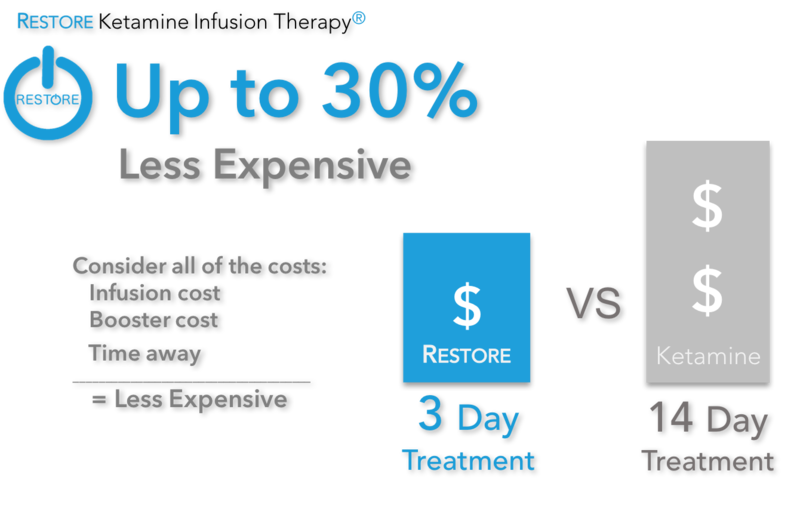 The advantage of the RESTORE Ultra-Rapid Infusion is that it is faster, more effective and longer lasting. Patients do not need to return on an ongoing basis for continued infusion as they do with the standard ketamine infusion. In addition, the restore Infusion can successfully treat not only mood disorders but also migraines, fibromyalgia and chronic pain. patients that have had benefited from the standard infusion and wish to continue with what was effective for them. In terms of insurance coverage, while we hope that insurance companies will begin to cover this service in the next 2-3 years, now they do not. To help our patients, we do provide them with a medical invoice to help them recover some of the costs. Now you can see why the RESTORE Infusion is less expensive than ketamine infusions. We accept all major credit cards and cash. We have approached Care Credit to assist our patients with any of their financing needs, but so far they have declined providing this service. But we hope that they will reconsider, please feel free to call them and ask. It's just as important that you know who is administering your infusion and how much knowledge and expertise they have in the filed, so learn a little more about us.